MSI 865PE Neo2-FIS2R PCSTATS Review - What the heck is CoreCell? What the heck is CoreCell? We've tested some very feature rich motherboards in the past few weeks but rarely do those motherboards come bundled with all the necessary cables to take advantage of all the on board components. The 865PE Neo2-FIS2R on the other hand comes with all four Serial ATA cables (for the four Serial ATA ports and SATA-RAID) as well as a two Molex Y Serial ATA power connectors! If you're lucky enough to get a Serial ATA HDD, you won't need to buy additional hardware to get the drive to work with the motherboard. MSI even includes one rounded IDE cable for good measure! The first time I powered on the i865PE Neo2-FIS2R I thought the motherboard blew a capacitor as I saw flashes of light and just about had a heart attack. Upon closer inspection I found the northbridge fan was laced with a few multicoloured LED's which blink on and off in different patterns for effect. Certainly a very cool option and anybody with a window in their case. The Intel 82547EI is a small BGA chip which has a direct 16 bit DDR bus that runs at 133 MHz and handles the GbE network adaptor. The system caps off with a maximum bandwidth of 266MB/s, just enough to keep a fully moving Gigabit 10/1000 NIC happy (Maximum bandwidth for a Gigabit NIC running full duplex is 2Gb/s or 250 MB/s). 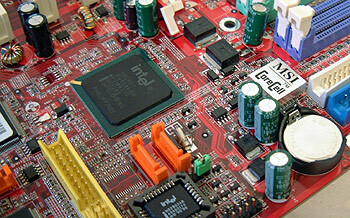 This chipset also free's up bandwidth in the PCI bus for the other system devices. This entire system potentially allows for better overal performance throughout when all the devices in the system-bus are under load. More on CSA in a moment though... Next let's have a look at the new ICH5R southbridge. 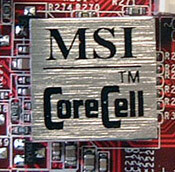 MSI's Core Cell Looks Cool, but what does it do? No doubt by now you've noticed the aluminum Core Cell block just under the DIMM slots on the motherboard. What exactly is Core Cell, and what does this new chip do? Core Cell is MSI's new catch phrase (read: marketing tool) and it has a number of features from decreasing overall system noise to power saving functions, prolonging the life of system components and even overclocking apparently. Depending on what you're doing Core Cell can slow down the Northbridge and CPU fans by up to 50% which should dramatically reduce overall system noise for those of you who are sensitive to sound. Unfortunately MSI's literature is not very specific so I'm not sure how their Core Cell technology saves on power or prolongs the life of your components. Info is hard to come by so I have to admit we're a little in the dark on the full explanation of this little IC which hides below the aluminum block. Probably the biggest feature MSI are touting for Core Cell are its' overclocking functions. It apparently gives the end user the ability to not just overclock their system within Windows (FSB and voltage adjustments available), it also allows the system itself to dynamically overclock your computer by default (up to 10%). While this is a really cool option, I don't think MSI should enable it by default. Nvidia are also set to release a similar feature for their own boards which allow users to dynamical overclock their systems, so keep that in mind if you're an AMD fan. I guess the only thing I found lacking was that the package we received for testing lacked a rear panel I/O cover. 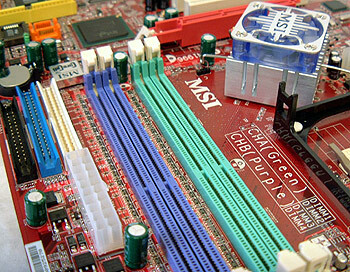 I'm sure this is a one off though as all other MSI motherboards we have tested in the past which do not use the standard rear I/O configuration came with the appropriate brackets.If you'd like to learn a bit more on i865PE technology please read the AOpen AX4SPE Motherboard review. Pg 2. — What the heck is CoreCell?